Somehow I blinked and it’s mid August. Labor Day is in sniffing distance, the days are getting shorter, the stores are full of sweaters, and I seem to have missed summer. Every year I have a mental list of things that I will do in the summer. Swimming in a cold pool, then lying in the sun until my swimsuit is dry, then jumping back in. Going on the ferris wheel at the pier. Sitting in my garden as the sun gets low, drinking Pimm’s Cups and chatting with good friends. And here it is nearly September and there are so many things still on my list. But one thing I have done is enjoyed the summer produce. I love the berries and the peaches, the watermelon and the plums. 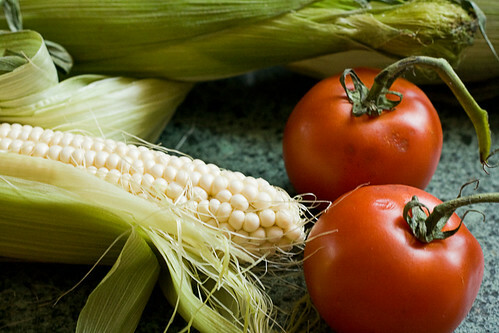 But nothing screams summer quite like corn and tomatoes. These vegetables, so anemic and disappointing if you venture to eat them fresh during any other time of the year, bust out into full, sweet glory in the summertime. More than anything else, summer is eating corn, spread with butter, each sweet juicy kernel bursting in your mouth. And summer is the smell of red, ripe tomatoes, the juices dripping down your chin. This pie is summer. I saw the recipe last year, when it was printed in the dear, departed pages of Gourmet, and filed it for later. Later is now, because this pie is phenomenal. 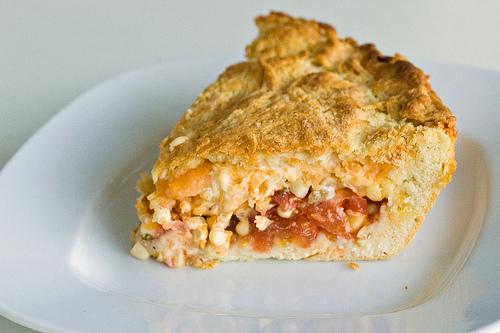 Sweet crisp corn and juicy tomatoes, bound together with creaminess and cheddar cheese, and if that wasn’t enough to tempt you, the pie crust here isn’t a regular old pie crust, but buttermilk biscuit dough, rolled thin. This pie is the taste of summer camp, of fireflies, of jumping in a cold lake and sweet months of vacation. This pie is the summer I’ve been missing. Like all of Gourmet’s recipes, this was pretty darn good to begin with, but I adapted it slightly. I love basil, but I find it can dominate a dish and make everything taste Italian, so I swapped it with thyme. Likewise, I have an aversion to baking powder, and replacing the standard biscuit dough with a buttermilk one allowed me to cut down the baking powder and add a nice tang. Also, I don’t usually believe in fussiness, but I believe that peeling the tomatoes improves this pie. To do it, cut an x into the skin at the bottom of each tomato, then plunge the tomato in boiling water for a few seconds and then into ice water. The skin will peel off easily. Try this even if you’re not a mayonnaise lover — it adds creaminess and binding power more than flavor, but be sure to use a good mayo all the same — my favorite is Trader Joe’s Real Mayonnaise. Whisk together flour, baking powder, and ¾ teaspoon salt in a bowl, then cut in the butter (cut the butter into slices or cubes, then mix in with a pastry blender or your fingers until the mixture resembles sand). Add the buttermilk and stir until the mixture forms a ball. Divide dough in half and roll out 1 half to a 12 inch round and transfer the round to a 9 inch glass pie plate (I rolled out on silpat, then used the silpat to transfer to the pie plate. This dough is softer and stretchier than regular pie dough-- you can also try rolling out between 2 sheets plastic wrap). Slice tomatoes to about ¼ inch thick. Cut the corn off the cob. Combine the mayonnaise and the lemon juice in a small bowl. 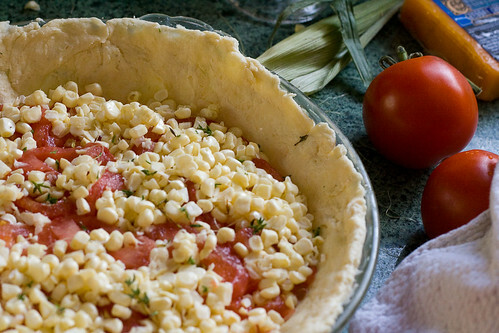 Arrange half of tomatoes in crust, overlapping, and sprinkle with half of corn, half of thyme, a generous pinch of salt and a grinding of black pepper. Repeat with the remaining tomatoes, corn and seasonings, then top the whole shebang with 1 cup of grated cheese. Roll out remaining crust to about a 12 inch round, then drape it over the pie, and pinch the crust to form a seal. Cut steam vents in top crust and brush crust with melted butter. Bake 30-35 minutes until the crust is golden, then cool on a rack. Serve warm. I know exactly what you mean. Just today I noticed that fresh strawberries are available all over the show here in my neck of the woods. This means that Spring is very close now. Unfortunately for you this means Autumn is approaching. 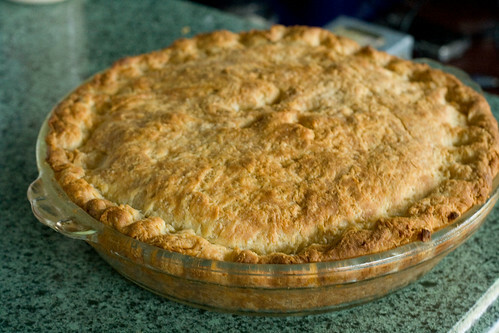 This pie looks good, I really enjoy your photos as well. Thanks. It looks like a perfect late summer dinner. Looks great! We haven’t enjoyed the corn and tomatoes enough this summer, so gives a good reason to make up for lost time. Holy cow! That’s not exactly diet food, but it sure looks good. My husband is phobic about mayo though. The limitations in my house are geting tiresome, I know. I spend summer weekends in Rensselaer County in upstate NY where tomatoes and arugula grow in my garden, and the corn I eat is grown by Larry Eckhardt on Kinderhook Creek Farm. Saturday lunch in August is always tomatoes still warm from the sun sliced and spread with mayonnaise to which a little red wine vinegar has been added and corn steamed and slathered with butter, cracked pepper, and Maldon Salt. Great recipe Kate..beautiful pie with beautiful produce. I have this in my recipe notebook and remember everyone talking about it last year. I need to make it before our summer (which never really started) is over. Glad to know it is as good as it sounds. An aversion to baking powder? Can you taste it? Just found your site from your smart comments at IFBC today. This crust looks totally amazing and perfectly baked. And I love any recipe that involves corn OFF the cob.